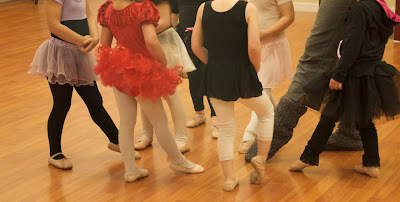 Last Saturday, when I went to collect Cholita from dance, her teacher met me at the door and with wringing hands asked if my daughter might perhaps be better suited to...... oh, I don't know, maybe a tumbling class..... rather than a structured ballet class. Combined with Cholita's ho-hum appraisal of the whole experience, I decided she just wasn't ready. I'd tried to fan the flames too early, and now I'd snuffed out the fire for good. Then a few days later, while running errands, a neon sign flashed past. DANCE, it said. I flipped the car around and saw that it was a brand new dance studio. A banner with the words "Grand Opening" was strung across the building front. I asked Cholita if she wanted to try dance just one more time. She enthusiastically agreed. The owner saw us coming and met us at the door. 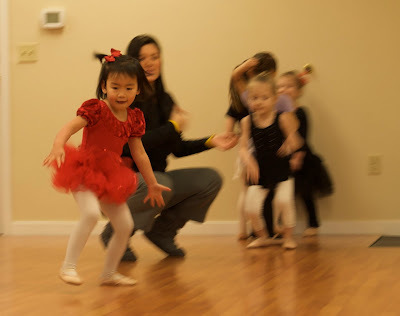 With enthusiasm equal to Cholita's, she described her vision of a four year-old's ideal dance class. "Fun," she said. "Just lots of fun." Not an hour, which is what we'd experienced, just a half hour. Instead of staying on an assigned dot (or in Cholita's case, NOT staying on her assigned dot), this class encouraged lots of free movement. And the kicker, the piéce de résistance-- she told Cholita that she did not have to limit herself to a pink leotard. "Wear whatever you'd like," she gushed. And so today Cholita started. Can you pick her out? 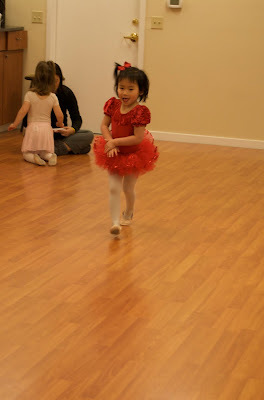 If you guessed the red velvet leotard and sequined tutu, you were right. Cholita was a little shy at first, but the music, not classical piano like the first studio, but a mix of Disney Princess theme songs, lured her in. 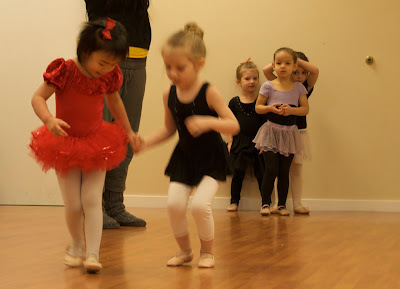 The teacher showed her not only how to walk on her toes, but walk on her heels. Cholita did it with style. She made friends. She skipped. And she ended with a flourish. A sticker from the teacher and her joy was complete. I can see this one Eileen... Now I will go back and read! So glad you found a perfect fit for her. 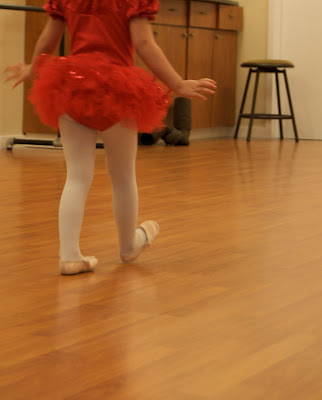 Now if you can just find some red ballet shoes to match! 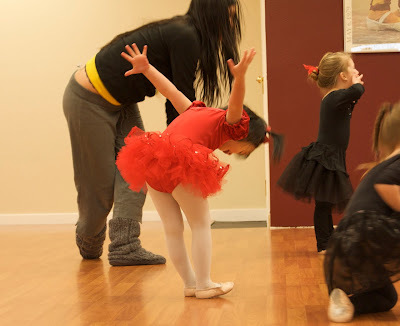 I'm glad Cholita gave dance another chance and that you found the right teacher for her! 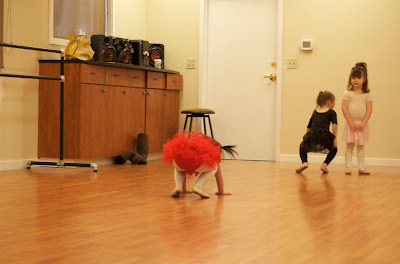 My girls do a ballet-tap-tumble class that suits them to a T. Can't wait for more dance updates and photos! SHe looks so happy! P.S. 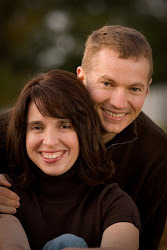 I've been reading your blog since I read one of your posts at No Hands but Ours. AH yes!! Perfect! 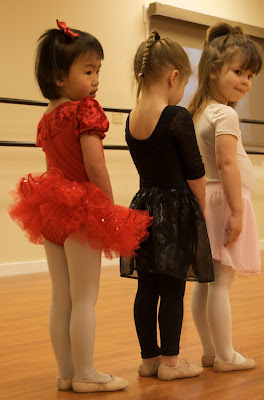 Summer had her first ballet class this week and it was definitely like Cholita's second class. She loved every minute of it. I don't think it should be any other way!! It was funny though, 2 or 3 of the girls in SUmmer's class were, should I say, ENERGETIC...and Summer was telling them to stop and listen, this all being on her first day! ha ha She probably would've enjoyed the class where everyone had to stay on their dot! Oh, I love that! 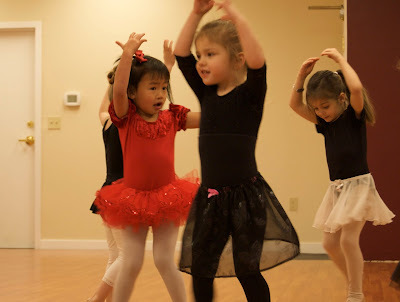 They just aren't ready for serious ballet at 4. I love that teacher's philosophy! 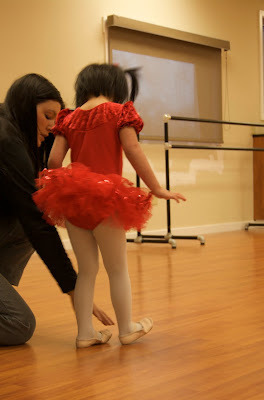 We put our daughter into tumbling classes when she was 3.5 thinking it would burn energy and keep her from breaking her neck at home. She just got into better shape and spends 20 hours at the gym every week doing competitive gymnastics. So glad you found a good fit for Cholita! What's been cooking up in our kitchen.